1. "Sgt. Pepper's Lonely Hearts Club Band" by the Beatles. It never got better than this. 2. "Abbey Road" by The Beatles. John Lennon wasn't thrilled that Paul turned the album into a concept album. He went along with it, and we should be glad he did. 3. 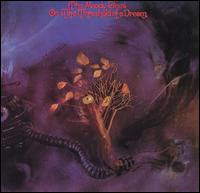 "On the Threshold of A Dream" by the Moody Blues. A great album by the most "classical" oriented rock band. (Or if you think "Pink Floyd", I won't argue). Their best work. 4. 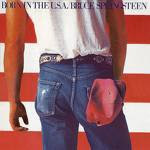 "Born in the U.S.A." by Bruce Springsteen. The Boss has a ton of great ones, but this is the best. From the 80's, President Reagan thought it was "patriotic", he hadn't heard the words to the title cut. 5. "C'mon, C'mon" by Sheryl Crow. This album sounded like an all time classic the very first time I heard it. Crow's best by far. 6. "Cracked Rear View" by Hootie and the Blowfish. Sure, it got overplayed, but what an album. I really thought that they might be the band of the 90's until their second album, "Fairweather Johnson" came out. Boy, was that awful. 7. "What's the Story Morning Glory" by Oasis. You would think that I, as such a HUGE Beatles' fan might not care for a 90's-00's band that ripped them off. I always thought that was over stated. Sure, they were heavily influenced, but were not a real "sound alike" band. Great in their own right. 8. "Congratulations, I'm Sorry" by The Gin Blossoms. My favorite alternative rock group of the 90's, their founding member/song writer died young (by suicide). All of their hit albums came after that but were together relatively a short time. In 2006 they reunited and produced "Major Lodge Victory." WTIT was impressed by the CD. 9. 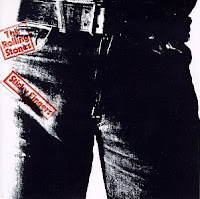 "Sticky Fingers" by the Rolling Stones. Their best album ever. Which is saying quite a bit, since they have had so many great ones. Remember the real zipper on the original LP? 10. 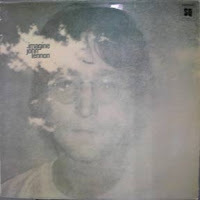 "Imagine" by John Lennon. 'Nuff said. 11. 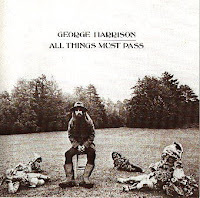 "All Things Must Pass" by George Harrison. 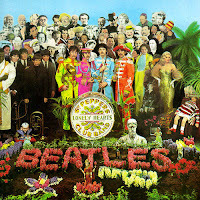 The biggest individual Beatle album after the breakup initially. Great double album. (I know it was a triple, but the "jam" third album sucked). 12. 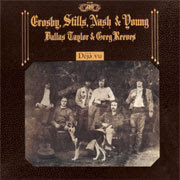 "Deja Vu" by Crosby, Stills, Nash and Young". Not a bad song here, by far the best album the four or three, have done. It won't be topped. 13. 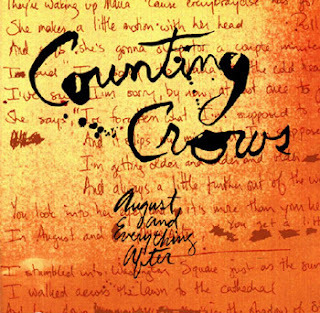 "August and Everything After" by The Counting Crows. Led by Adam Duritz, the best songwritter over the last ten years. They have never had a bad album. Adam writes a blog by the way, on the Crows' website. 14. 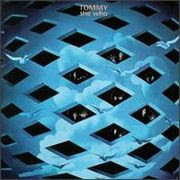 "Tommy" by the Who. The first rock opera is still the best. Made into both a show and a movie, the story of Tommy is much better told by listening to the album as you read the words. 15. 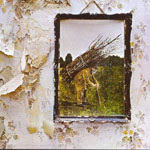 "Led Zeppelin IV" was not the actual name of Zep's fourth album, but since the name was symbols, that is what we called it. WTIT's number one song of the 70's, "Stairway to Heaven" is on this album. 16. 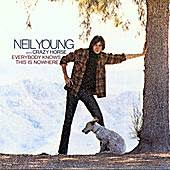 "Everyone Knows This is Nowhere" by Neil Young. While "Harvest" was a much bigger seller I always thought Neil never has been better than this, his follow up to his first solo album, "The Loner." 17. 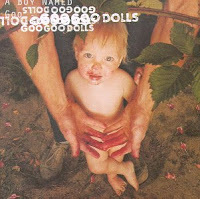 "A Boy Named Goo" by the Goo Goo Dolls. One of the best bands as modern rock became the rage in the 90's. The band does not release bad albums to this day. 18. 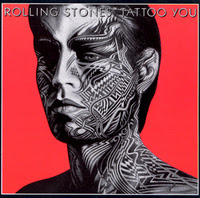 "Tattoo You" by the Rolling Stones. From the eighties, this album was a shock. It rates up there with the great Stones' albums of the 60's and 70's. 19. 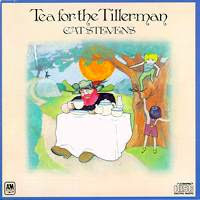 "Tea for the Tillerman" by Cat Stevens. All his 70's albums were great, but this was the best. It is good to see him back with a new album this year. While that album is no "Tea for the Tillerman" is has a great cover of "Don't Let Me be Misunderstood". 20. 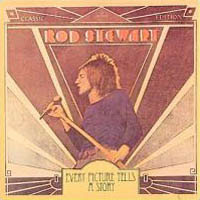 "Every Picture Tells a Story" by Rod Stewart. One of the great rock singers of the era. From the Jeff Beck Group and then Faces, this was not his first solo album (I believe it was third) but it established him as a superstar. 21. "Sports" by Huey Lewis and the News. The best band of the eighties. You've probably seen the photo of Huey and I. I only met him once, but he is a terrific guy. 22. 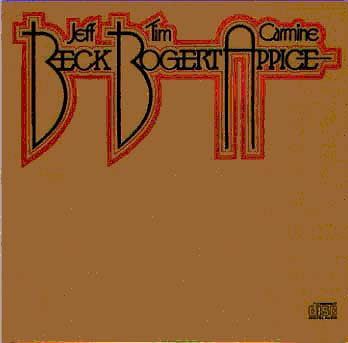 "Beck, Bogart & Appice" a self titled album. Critically well received and the best non-hit album I've ever heard. Jeff Beck from the Yardbirds and Jeff Beck Group, Tim Bogart from Cactus and Carmen Appice the drummer from Vanilla Fudge created this unbelieveable album. They broke up during the recording of their second album. 23. 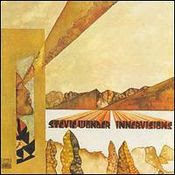 "Innervisions" by Stevie Wonder. Any of Stevie's concept albums of the 70's could be on this list. When pressed, this is my favorite. What an amazingly talented guy. 24. 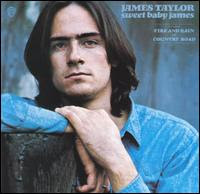 "Sweet Baby James" by James Taylor. James Taylor was one of the first artists the Beatles signed on Apple Records. His first album on album was good, but his second on Warner made him a superstar. It still holds up well. And James stills sells a lot of music. 25. 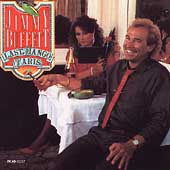 "Last Mango in Paris" by Jimmy Buffett. My closest friends were all "Parrot Heads" and I never got it. When I went through my first divorce I listened to this album, which is all about relationships. Jimmy is one of my favorite artists now, I have every album he ever recorded. But this will remain my favorite, though my Parrot Head friends insist "Off to See the Lizard" is better. 26. “Rumours” Fleetwood Mac. How I missed this on my first list, I don't know. You cannot hear these songs enough. 27. 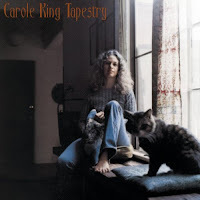 “Tapestry” Carole King. For a long time, the best selling album of all time. It has to be still in the Top 10. 29. 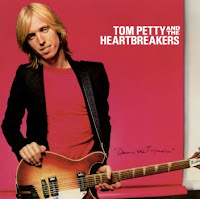 “Damn the Torpedoes”. Tom Petty and the Heartbreakers. A perfect album. You cannot get sick of this music. 29. “Glass Houses” Billy Joel. Side One is Billy's best rock and roll. Period. 30. 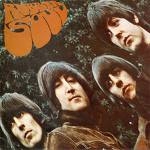 “Rubber Soul” Beatles. OK, I could have added either The White Album or Revolver. But I chose Rubber Soul. Deal. 31. “Pet Sounds” Beach Boys. Paul McCartney calls this his favorite album and said it inspired Sgt. Pepper. Not bad. 32. “The Rising” Bruce Springsteen. I thought he'd never come close to "Born in the USA". I was wrong. 33. 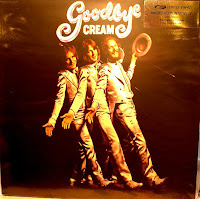 “Goodbye” Cream. When they said "Goodbye" I thought they'd return. I didn't know we'd wait nearly forty years. 34. “Nimrod” Green Day. Best rock band today. And for the last ten years. 36. 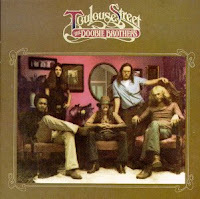 “Toulouse Street” Doobie Brothers. Jesus wasn't the only thing "All Right" with this album. 37. 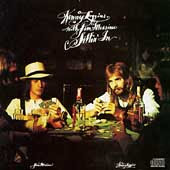 “Sitting In” Loggins and Messina. I was in a record store and this was playing. I thought "Wow. Who is this?" So I asked. I said I want it. He said, "Sorry, sold out." 38. “Let It Bleed” Rolling Stones. Nothing needs to be said here. 39. 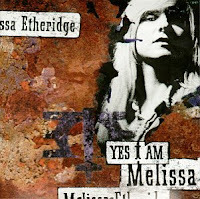 “Yes I Am” Melissa Ethridge. I never thought I'd like a female rocker as much as Pat Benatar. But I do. 40. 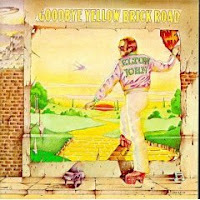 “Goodbye Yellow Brick Road” Elton John. They called it his "White Album". It was Elton at his best. 41. “X & Y” Coldplay. They don't do a bad song or album. This is their most recent. 42. “Low Spark of High Healed Boys” Traffic. Steve Winwood and the boys at their best. 43. “A Place in the Sun” Lit. My son Ben said I'd love this group and album. He did not lie. 44. “1984” Van Halen. Eddie can't seem to get along with anybody but I challenge you to name a better guitar player. As good, but not better. 45. “Can’t Buy a Thrill” Steely Dan. The record company took out a full page ad in Billboard before this album was released. It simply said: "Steely Dan. A band you will never forget." They weren't kidding. 46. “The Wall” Pink Floyd. Never a big fan of this band, but I couldn't overlook this album. 47. “Working Man’s Dead” Grateful Dead. While the Dead were all about concerts, they put together solid albums as well. This was their best. 48. “Street Corner Symphony” Persuasions. In college, Stu (my roomate senior year, of "Sparky & Stu) and I had to listen to this album before we hit the road. It is still fabulous. 49. “Bat Out of Hell” Meat Loaf. He hooked up with Jim Steinman, the writer of the songs he did with "The Rocky Horror Show". This bad boy rocks. 50. “Pieces of You” by Jewel. 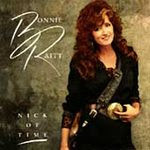 This album included "Foolish Games", "You Were Meant for Me" and "Who Will Save Your Soul". Not a bad first album.